Welcome to my site! I'm a screenwriter, playwright, and novelist working and teaching in southern Ohio. A few of my interests include Golden Age Detective Fiction -- think Agatha Christie, or better yet, the wonderfully underrated British mystery author Gladys Mitchell, for whom I've created a comprehensive tribute site at www.gladysmitchell.com -- and Dogs of all shapes and sizes. My current canine companion, a Goldendoodle named Motley Otis, enjoys my storytelling when it takes the form of fetch, frisbee, or a treat. I hope you spend some time learning about my many projects and sampling my original scripts and stories collected here. My blog features several book reviews of classic and contemporary mysteries from authors like John Rhode, Richard Hull, and Henry Wade; please check it out if you are a fan of Golden Age Detective fiction. I welcome correspondence and feedback, and you can contact me at jason@jasonhalf.com . Jason Half is a graduate of Ohio University’s M.F.A. Playwriting program. His stage plays have had readings in Chicago and Pittsburgh and performances in Maine, Ohio, and Minnesota. He is the recipient of the 2010 Scott McPherson Playwriting Award and, as writer and director, his film THE BALLAD OF FAITH DIVINE won the Best Feature award at 2009’s Colony Film Festival. His one-act play LOCKED ROOM MISERY has received productions at Marietta College and Washington State Community College in southern Ohio. Recently, two television scripts have been finalists in national screenwriting contests. Jason has taught film, theater, scriptwriting, literature and composition courses at colleges in West Virginia and southern Ohio. December 1, 2018: A new short story in a new anthology! Check out my coastal Maine mystery "The Last Ferry" in LANDFALL: the Best New England Crime Stories. Print and eBook editions are available at Amazon.com. Lots of entertaining tales in this collection from Level Best Books. November 3, 2018: My short story "The Widow Cleans House", first published in Alfred Hitchcock's Mystery Magazine, is now available in an anthology from Eris Press. TERROR AT THE CROSSROADS: Tales of Horror, Delusion, and the Unknown can be found at Amazon.com and other eBook sites. 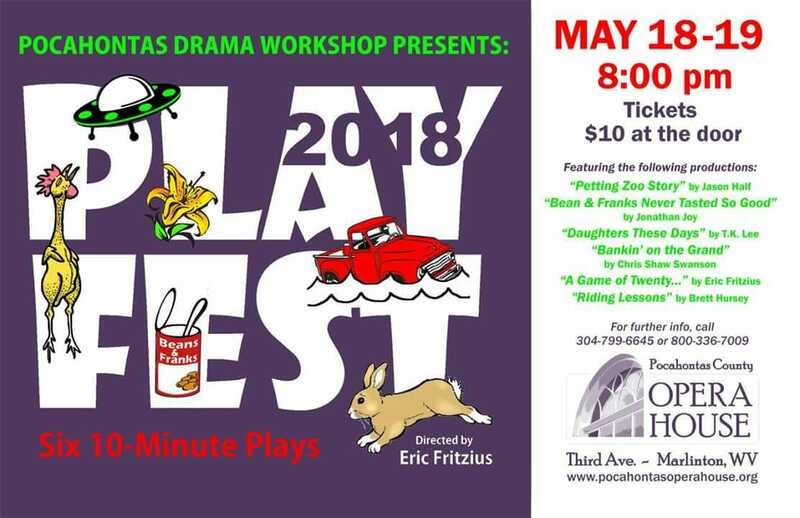 May 18, 2018: Happy to attend the 2018 PlayFest at the Pocahontas County Opera House in Marlinton, West Virginia, where my 10-minute play PETTING ZOO STORY receives its premiere, along with other great pieces by Eric Fritzius, Brett Hursey, and Jonathan Joy. Congrats to the actors, designers, and crew for presenting a great weekend of new plays! April 21, 2018: A staged reading of my brand-new play FALSTAFF, DISCONNECTED will occur Saturday, April 21 at Marietta College. The contemporary comedy-drama was inspired by King Henry IV, Part One, and was written for the American Shakespeare Theatre's New Contemporaries contest. March 1, 2018: My one-act play LOCKED ROOM MISERY returns to the Marietta College theatre stage, where it is one of four featured play for the student-directed 2018 ONE-ACT FESTIVAL. Congrats to actors, directors, and crew on an enjoyable set of productions. September 9, 2017: Level Best Books has released the anthology NOIR AT THE SALAD BAR, a collection of culinary-themed mystery and suspense stories. I am very pleased that my short story "Bases Looted", a sort of locked room comic mystery that takes place in the skybox of a baseball stadium, is included! Print and eBook editions are available through this link at Amazon. June 17, 2017: The current issue of Alfred Hitchcock's Mystery Magazine (May/June 2017) features as its Mystery Classic Gladys Mitchell's short story "Daisy Bell". I was thrilled to be asked to write an introduction for my favorite mystery author, and greatly enjoyed working with the editor to choose an entertaining Mrs. Bradley tale to share with readers. May 20, 2017: Three short plays of mine will be read at MT Pockets Theatre in Morgantown, West Virginia. IN THEIR VOICES, an evening celebrating Appalachian playwrights, will also feature work by talented writers A.J. DeLauder, Jeremy F. Richter, Eric Fritzius, and Steven McElroy. June 11, 2016: I am honored to discover that my one-act play LOCKED ROOM MISERY has won third place at the 2016 West Virginia Writers Annual Writing Contest. Congratulations to Jon Joy and A.J. DeLauder, who also received honors and recognition in this year's playwriting category. This was the first time I was able to attend the WVW conference in Ripley, West Virginia, and it was fantastic to hear from authors and publishers and to meet many, many talented people. April 1, 2016: I am pleased to announce that my short story THE WIDOW CLEANS HOUSE will appear in the July/August 2016 issue of Alfred Hitchcock Mystery Magazine. ﻿It's a strange little tale that I wrote more for myself than with any thoughts of capturing a publisher's interest, but I'm thrilled that AHMM chose it for their excellent magazine! December 4, 2014: My play SUNDIAL, which explores the effects of mountain-top removal coal mining on an Appalachian community, received a reading at Ohio University sponsored by the regional chapter of The Dramatists Guild. This play is available for readings or productions; please contact me for more information.